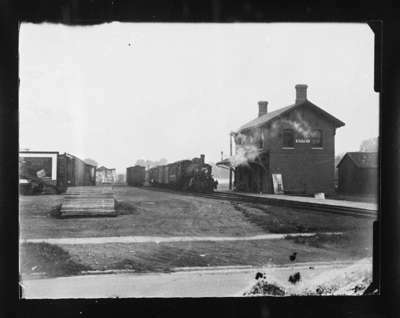 Black and white negative depicting the uptown station for the Grand Trunk Railway in Whitby. A train is pulling into the station. Lumber is piled at left. Also at left, an advertisement for Sunlight Soap. The uptown station was located on the south side of Dundas Street East, opposite Hickory Street. It was built in 1870 for the Port Whitby and Port Perry Railway. It was closed in 1963 and demolished in 1969.